1) Managed and facilitated meetings with preceptors at 11 affiliated hospitals. Served as the chairperson of numerous committees for the MAND. 2) AND Media Spokesperson for 9 years. Conducted over 1,500 media interviews. 3) Authored 3 college textbooks, based on the current nutrition science and public health issues affecting our profession and society. 4) Spoke at many professional meetings including FNCE. More than 20 of my graduate students have served on state/national nutrition boards. 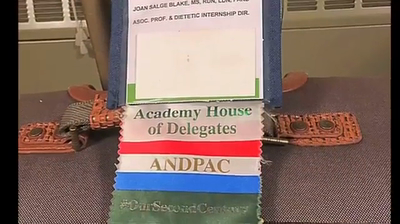 Academy of Nutrition and Dietetics (AND) National Media Spokesperson AND 2007 - 2016 I have served as an AND National Media Spokesperson for nine years, the maximum term allowed for Registered Dietitian Nutritionists (RDN). The program is designed to promote science-based nutrition information on behalf of AND and its members. To date, I have conducted over 1,500 media interviews in print, online, television, radio, and podcast media outlets, on a plethora of nutrition issues. Through these media impressions, I have continually promoted the RDN as the nutrition expert and the Academy as the largest organization of food and nutrition professionals committed to improving the nation’s health and advancing the profession of dietetics and its members. House of Delegate Massachusetts Academy of Nutrition and Dietetics (MAND) Board 2017 - 2019 I am currently serving in the AND House of Delegates (HOD) as the elected affiliate from Massachusetts. I have also been selected to serve on a subcommittee within the HOD to assist in providing the vision and new structure as to how this governing body will best serve its members and key stakeholders strategically, efficiently, and effectively in the future. The ongoing nutrition science continues to support the role of our members in every area of nutrition practice, including clinical, research, education, community, food service, public health, and policy. We all need to work together to channel our passions and expertise to become stronger as a professional organization. Together, there is no stopping our profession to lead the nutrition science and also educate and protect the consumer. Follow the science and your passion. Together, we can compassionately empower the public to fight their nutrition-related medical issues with a knife and a fork.